ALBERT PIKE RECREATION AREA  The water’s powerful current splintered families camped along the Little Missouri River. Two children clung to a tree as their mother was swept away. Aging childhood sweethearts, married for decades, were yanked apart. Those able to keep their heads above water became targets for chunks of concrete, vehicles and upended trees launched by the turbulent river. Kerri Basinger clung to her two young daughters as the engorged river tossed and tumbled its human cargo. But the same current that pulled up slabs of asphalt the size of swimming pools eventually ripped the little girls from her arms. 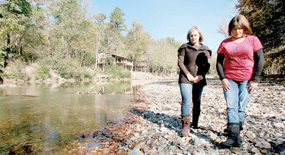 As the river swept Kerri away, she could hear Kinsley, 6, calling for her. “I can’t!” Kerri yelled even as she tried feverishly to reach Kinsley. Through the darkness, Kerri saw her oldest daughter, Jadyn, 8, go by, frantically dog-paddling as she struggled against the current, too far away for her mom to save her. Again and again, Kerri swallowed water, choked, gasped for air. She became entangled in her pajamas until the current tore her clothes away. Debris pummeled her. Unknown objects banged repeatedly into her head. Broken bones. I’ve gotta have broken bones. How strange, she thought, that she felt no pain. Kerri grabbed at trees, but the branches kept breaking. And then the river would push her down, down, down, into its murky depths. This is it, she told herself, echoing in her mind the words she’d said to her husband only minutes before the floodwaters consumed them. Then, she popped back up to the surface. Are you kidding me? If I’m gonna die, let me go now. The Basinger family camped by the Little Missouri River every summer, along with their friends, Anthony and Candace Smith, and their children. Usually, they stayed at Lowery’s Camp Albert Pike RV Park and Cabins, owned by Janice and Denver McRae. They liked the camaraderie that permeated the place. But on June 10, when the two families arrived at Lowery’s, they’d made an impulsive decision to spend their first night at a nearby federal campsite in the Albert Pike Recreation Area’s Loop D. The couples’ teenage sons wanted to sleep in a tent, and Lowery’s didn’t allow tent camping. The Basinger clan consisted of Kerri; her husband, Shane; his son from a previous marriage, Kyler, 14; and Kerri and Shane’s two daughters — Jadyn and Kinsley. The Smith family consisted of Anthony and Candace; Anthony’s son from a previous relationship, Austin, 13; and the couple’s two younger children — Joey, 5, and Katelynn, who was about to turn 3. Austin had brought along his friend Brady Pate, 15. That night, the three teens bunked down in their tent at Loop D’s campsite No. 2. The adults and younger children slept in a Wildwood RV. But neither the Smith and Basinger families — nor any other family there that night — should have been in RVs. Nearly ten years earlier, when the U.S. Forest Service began making plans to allow camping at Loop D, a soil specialist advised longtime District Ranger James Watson to build only primitive and tent camping spots there because Loop D was in a 100-year flood plain. The specialist worried that RV-camping would disturb the terrain. “Things such as electricity, water and sewer hookups should not be planned,” the specialist said in a letter to Watson. He also strongly recommended that flash-flood hazard signs be placed there. But Watson pushed forward with plans to include electricity and water hookups at the new Loop D campsites. He didn’t include the soil specialist’s warnings in his environmental reports about the expansion. Watson did this, investigators would say, because he wanted to meet perceived public expectations for the popular campground. There also were problems with a hydrologist’s elevation reading, which led to confusion about where the flood line was. The district ranger also failed to tell architects and engineers working on the project that Loop D routinely flooded at least a couple of times a year. As a result, no special precautions were taken to elevate or move campsites to make them safer. Shane Basinger knew none of this, but he still felt uneasy as a thunderstorm hovered over the campground after his family went to bed. He woke repeatedly to check on the weather. Though there had been Forest Service employees at the campground that day, neither Shane nor any of the other campers had been told of two flash-flood watches — and later, a flash-flood warning — that had been issued for the area. He gave them a choice: The RV or Anthony’s pickup. The boys chose the truck. Most of the other tent campers staying at Loops A and B just across the river also abandoned camp. Bill Paxton climbs up to his cabin at Lowery’s Camp Albert Pike. To the right is the RV that slammed into the cabin. In the early morning of June 11, Bill pulled an elderly couple and their granddaughter through the RV’s partially open door and onto his balcony. Their nylon shelters had proved too flimsy for the weather. After Shane returned to the RV, Anthony went outside to check on the teenagers. Water swirled around his ankles. He ran back to the RV and flung open the door. “Get everybody and get out!” he yelled. Kerri and Candace gathered their children and stumbled outside in their pajamas. By the time they got to Anthony’s pickup, water covered their knees. The river gushed into the cab, forcing the two families to seek shelter in the pickup’s bed. At first, trees and debris served as small dams, restraining the river. But when those blockages dislodged, the Little Missouri surged forward. The result was a mountain tsunami, one that seemed to devour Loop D in one greedy gulp. As the river consumed the campground, some people awakened only after their temporary homes began floating. Several found themselves trapped by doors and windows they could no longer open. The water coursed over Anthony’s pickup, washing the two families away. Like Kerri, Candace became separated from her children. The current slammed her into one tree, then another. Cars and RVs passed her in the river. One had its flashers on. Anthony managed to hoist Shane’s son, Kyler, into a tree. “Mr. Anthony, don’t let me go,” the teenager begged. By then, Kerri had lost sight of both of her girls. Water filled her lungs. Then, suddenly, the current slowed. Kerri saw a cabin in the middle of the river’s newly forged path. As she approached it, the river loosened its grip, allowing her to swim to the house. Kerri grabbed at a windowsill, but it wasn’t big enough to hold onto. With renewed resolve, she busted the glass with her arm to get a better grip. Clinging to the window, Kerri screamed for help, straining to be heard over the river’s roar. Most of the people staying in cabins on Lowery land had been roused from their beds shortly after 3 a.m. by two wet and disheveled strangers, Matt Whatley and J.D. Quinn, 20-somethings up late drinking beer when the Little Missouri swallowed its banks. The pair had waded through the rapidly rising water, banging on the doors of 10 cabins and urging bleary-eyed residents to head for higher ground. By the time they made it to Brady and Gina Gore’s cabin on the ridge above the river, the raging water had submerged some of the cabins below. The Gores, who had parked on high ground behind their cabin, made it out just in time to see an arc of electricity streak below them. Then the power failed. Despite the inky blackness, they made their way to a small store uphill from the cabin where other cabin owners had gathered out front. The closest river gauge, about 8 miles south in the town of Langley, measured 15.66 feet. The Little Missouri had risen nearly 6 feet in 45 minutes. The sodden group of survivors huddled together in the driving rain, fretting about whether the other cabin owners were safe. Only later would they hear about a cabin owner across the river who ran through Lowery’s RV park rousing sleeping campers. He crammed about 30 people into his cabin, which sat well above the river’s reach. Thanks to him, to the two young men up late drinking and to a series of small miracles, everyone at Lowery’s — the cabin owners and families in RVs — made it out. But a bend in the Little Missouri had turned Lowery’s into a receptacle for the remnants of Loop D.
Janice and Gina were the first to hear Kerri. “Was that a scream?” one of them asked. A second cry pierced the night. It sounded as if it came from one of the cabins below. Had they missed someone? Brady Gore, a sergeant with the Arkansas State Police, ran for his patrol car. He’d driven it to the cabin because he had to work the next morning. After being awakened by Matt and J.D., Brady had driven the car up to the store. Now he hopped back in, following the two young men as they ran toward the screams. When Brady pulled up, he joined Matt, J.D. and several other survivors standing on a hill, maybe 40 yards from the window that had become Kerri’s fragile lifeline. Brady Gore, now a state police lieutenant, and his wife, Gina, walk past the fallen utility pole that Kerri Basinger clung to when floodwaters carried her from the federal campground to Lowery's Camp Albert Pike. The Gores' cabin is in the background. We can’t reach her. It’s impossible. “Hang on! Hang on!” the cluster of spectators yelled over and over again. That’s what Kerri needed to hear at that moment. She would come to think of the men as her angels. Brady ran back to his patrol car, turned his spotlight on Kerri and then picked up his police radio. The dispatcher wrote down Brady’s 4 a.m. message: Camping at Albert Pike and the water is rising, people are on their cars and campers — they need assistance because the water is still rising and all he has is his radio — someone is in the river calling for help. By that time, the water at the Langley gauge had hit 17.70 feet. Fifteen minutes later, 18.98 feet. At 4:30 a.m., the gauge marked 20.57 feet. It would finally peak an hour later at 23.39 feet. Kerri held onto the window, her battered body dangling in the water. “Don’t let go!” a voice called out. “Don’t let go!” a second voice yelled. A piece of floating furniture inside the cabin smashed into Kerri’s curled fingers. Pain shot through her hands. Once again, she was in the swirling, brown water. “There’s a pole behind you! POLE!” everyone cried. Kerri grabbed a wooden utility pole and bearhugged it. By then, the young mother felt certain that her daughters were forever lost to her. No way could two little girls have survived that awful, churning, debris-laden water. Still, Kerri held on, hoping her husband and stepson had made it. From the ridge, survivors hurtled words of encouragement. As the water finally began to recede, Kerri heard renewed vigor in the shouts from above. J.D. did most of the yelling. He had the loudest voice. Brady’s wife, Gina, watched for rescuers. But 10 minutes passed, and then another 10, and then another. She turned to her husband in frustration. Brady, who knew from radio traffic that rescuers were stuck behind a rock-slide on the only road into the campground, grabbed Gina’s face and locked eyes with her. And Gina realized they were on their own.